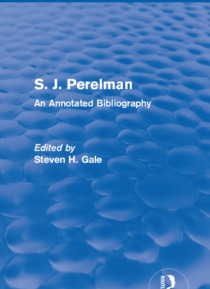 First published in 1985, this bibliography focuses on the works of S. J. Perelman as a humorist, author, and screenwriter. It is divided into two major sections: "e;Works by S. J. Perelman"e; and "e;Critical Responses"e;. Within each section, there are subdivisions which focus on various areas of S. J. Perelman's work, including his novel, published plays and film scripts.